When it comes to hiring as well as firing employees, we completely understand what a daunting and difficult task it can be. Hiring employees can certainly be difficult if you are looking to hire the best people in your team. At the same time, firing employees is a bit tricky as the person can trap you in your own game. In such cases, it is important to be careful and just for that, we have some interesting hiring and firing techniques that can help you in the long run. Keep reading to find out more! Here we are going to enlist some of the best techniques you need to keep in mind when it comes to hiring employees. If you keep a track of all these points, you will definitely be able to see the results fast enough. Scroll down to read more. The first thing you need to understand about having a good employee is that they need to be competent. See if the person you are trying to hire possesses all the skills, education and experiences needed for the tasks to be completed in a proper manner in the long run. If the person is competent, hard working and has the essential qualities needed, then they can surely become a part of your team. So make sure to search for this quality. The second quality you need to check is capability. See if the person has enough capacity to work in your office. Notice if the person requires easy tasks only or will they need more effort to complete a certain work. Capability usually means when the person has enough mental strength and is willing to grow and show more responsibility. Next quality that needs to be paid attention to is whether the person is compatible enough with the rest of the team. Will they get along with the partners and all potential clients? What you must also remember in such cases is to notice whether the person gets along with the boss and is willing to help them make changes in the office environment. If they cannot do that, then there naturally will be problems. Another thing that should be valued is whether the person is looking for some kind of commitment or not. Do notice if they are just passing through or are they in search of something better? Having a whole list of past jobs and the time that is spent definitely proves that they need some clear insight on the matter. Finally you need to see whether the person has the right values that align with you. See if they are honest and if they are good at keeping promises. Are they always above reproach? Do they come across as a selfless or a team player? If they have all of these qualities, then they surely do possess great character and should be a part of your team. Always remember that every business has some culture or a way where people will behave or interact with one another. Culture is something that is based on expectations, certain values, procedures, policies which will influence the behaviour of employees and leaders. The workers will not reflect the culture of the company which tends to be very disruptive and difficult. Another point that has to be remembered is compensation. Since you are the employer, you need to make sure that the person who has been hired agrees to the compensation package that is being offered to them. If that is not the case, then an employee will begin to feel unappreciated and because of that, they will not be able to perform very well. You should be careful about the stock that is granted by the company, if it is not handled well, then it may create some more challenges. Next you need to see is, if they have all the qualifications needed. A person only becomes good enough for the job when they possess all the qualifications that are required to do the job well. Next you must check whether they have soft skills. Social intelligence is one of the most important and best situations which are needed. Maynard Brusman who happens to be a famous psychologist has also mentioned that you shouldn’t become pigeonholed into believing that the person who has good experience is the best person for the role. You should consider soft skills including communication skills, interpersonal skills including emotional intelligence. This is an extremely common thing that most employers do. They make sure a background check is done on the person’s profile so that they know what the person is all about. It could be better than what you are expecting or even far worse than that. Even if it is risky to allow your candidate’s social media to help you into making decisions, it will also give you a good picture of someone who wants to hire you. The personality of a candidate is something we really must consider. For example, the trait like empathy would be a lot more for the nurse or even for a social worker, it would certainly be for the tax attorney. It could also be for a computer programmer. Experts have suggested that a person is great when they have all kinds of skills which are needed to become a good fit can definitely work in your office. So that is what you should be looking for. Leadership IQ is a study which found all the failures which are exhibited by the new employees could result in a bad and below average interview process. Most managers these days have interviews that are not focused on the issue too much. Some of them have lack of time and lack of confidence as well. Their ability to interview and to pay attention towards the red flag candidates will be exhibited during the process of interview. Finally, you must remember to ask people all the right kind of questions. You can never come out right and ask people if they are really jerks but you may ask them questions which may also help you figure out something on your own. Professors and experts have suggested that if you ask a person why they don’t work in their previous office and they blame it on a person, it is important that you ask them another question. If they blame the external forces all over their problems, you could search for another employee. Now that we are done with best practices and techniques you need to follow for hiring someone, let’s now find out more techniques on how you can fire employees without being too harsh on them. 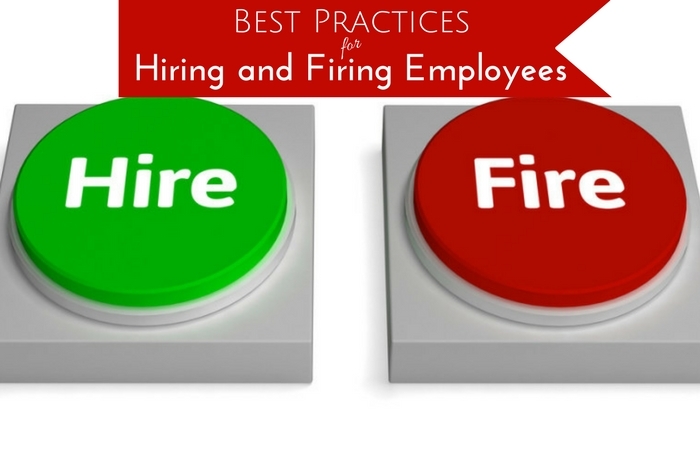 Before you fire someone, it is extremely important and essential to get everything arranged before hand. You have to practise what you are planning to tell the employee and if you have all the right documents that are needed to make the process as smooth as possible. In case you are afraid that the nerves may get in the way, you can jot down a few points as well. At a minimum, you will have to explain the process to all employees when it comes to leaving the building, returning all company owned items and the benefits and how long they will continue. Next you need to get hold of a good time and place. If you are going to say it to them, make sure the environment is professional. Also you should be free enough to attend them. Talking to them about leaving work can be quite stressful so you have to spend a few minutes talking about it. In that way it is advisable to find the right place and time. Next, make sure that you never rush into a meeting. You should spend at least 15 minutes before you can relax and really start talking about it. The person needs to have a genuine idea of what you are upto and what exactly you are looking for. The next thing you should remember to do is not to make things too difficult and complicated for yourself. If you are going to fire someone and want it sound pleasant and simple, you should not elongate the whole matter. We would always recommend you to be clear with your decision as much as possible and for that, keep things short and simple. The next you need to do is be polite as much as possible. Never be rude to someone just because you are firing them. Always remember that you are trying to maintain good and healthy relations with them. Therefore being polite is always a safe and effective way to get people out of your office. You might need them in the future anyway so don’t be rude at all. When you are firing someone, say maybe an employer, you have to focus on the facts and not try to tack the same employee as a person. You will have to follow a few laws which are specific for the region you belong to and the instances that matter. Therefore, check the facts that need to be followed. Next thing you will have to document the whole thing. If there is no documentation of the rules of the company and their requirements and expectations, including the fractions and disciplinary policies, you could end up with more and more lawsuits. Also keep in mind that you should never ever fire an employee on your own. Firing happens to be a very emotional and sensitive situation, so you will never know how a certain someone is reacting. It would be wise if you could go to your HR representative and present yourself during the meeting. If you don’t have an HR staff, just see that you have someone you can completely trust. Also see that they don’t take advantage of you. Finally, a termination is something that should never look like a surprise to your employees. The person who is working for you must get constant and some real time feedback when it comes to management. When the employee has been taken off guard and has no clue what is about to happen to them, you as an employer could land yourself into some major trouble. So try not to make that happen. Finally, you should remember to be consistent. Just make sure to find someone who is consistent enough with your previous behaviour and successes. Consistency is extremely valuable in cases like these. Also if you are firing someone for being rude and not firing someone for the same reason, it will show you are not consistent. With this, we like to bring the post to a full close. If you have liked reading the article and would like to tell us more about it, kindly let us know in the comment box below. We would love to hear more from you. If you have followed any of these techniques and found some benefit from that as well, do make sure to enlighten us on the matter. We would love to help and assist you in the future.